This one is so close, You can throw rocks at it. ASTEROID FLYBY: At 9:30 am on Friday, Feb. 15th, asteroid 2012 DA14 will fly past Earth only 17,200 miles above our planet’s surface. This will put it well inside the orbit of geosynchronous satellites, closer than any asteroid of the same size has come since regular sky surveys began in the 1990s. Researchers speculate that Earth’s gravity might even cause seismic activity on the 50m-wide space rock. 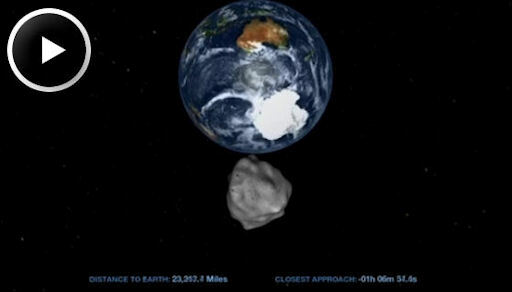 Click to view a computer simulation of the flyby, courtesy of NASA: Asteroid 2012 DA14 Flight PathAn animation depicting the trajectory of asteroid 2012 DA14 as it travels within the Earth-moon system on Feb. 15, 2013. During the hours around closest approach, the asteroid will brighten until it resembles a star of 8th magnitude. Theoretically, that’s an easy target for backyard telescopes. The problem is speed. The asteroid will be racing across the sky, moving almost a full degree (or twice the width of a full Moon) every minute. That’s going to be hard to track. Only the most experienced amateur astronomers are likely to succeed. For the rest of us, NASA will broadcast the asteroid’s flyby on NASA TV.Asteroid 2012 DA14 is about the same size as previous asteroids responsible for the Meteor Crater in Arizona and the Tunguska Event in Siberia. Unlike those objects, however, 2012 DA14 will not hit Earth. Even if seismic activity breaks the asteroid apart, there is no danger; the fragments would continue along the same non-intersecting path as the original asteroid. GO to www.spaceweather.com for the rest of the news. This entry was posted in Hazardous Weather, Predictions, Preparations, Solar Activity, Solar Events, Storms, Sun. Bookmark the permalink.